The Floyd Center for the Arts and Virginia’s Blue Ridge Music Festival welcome the talented Madison String Quartet to Floyd VA. Along with the concert Saturday evening the Quartet will lead a Master Class for local music students. The Madison String Quartet, praised for its energetic performances and inventive programming, is bringing a new side of classical music to the New York metropolitan area.Drawing on the international experience of its members, the Quartet “has carved a niche out for themselves by exploring Hispanic literature from both sides of the Atlantic”. 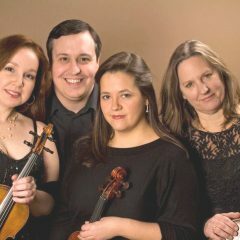 (Paul Somers, Classical New Jersey) The Quartet is involved in blurring the line between performer and audience, creating a comfortable performance atmosphere for masterworks from past and present. The Madison String Quartet is essential listening.